Jessica Scheno, a senior at Maranacook Community High School, speaks with reporters March 2 at the State House, where she and dozens of other students, doctors and health advocates decried Gov. 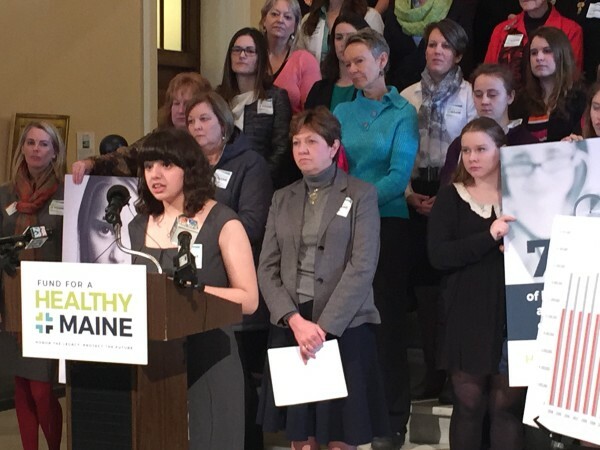 Paul LePage's proposal to gut funding for Healthy Maine Partnerships and school-based health centers, both of which work to prevent teen smoking. AUGUSTA, Maine — Gov. Paul LePage’s administration is due to unveil its road map for Healthy Maine Partnerships’ future, and that has public health advocates bracing for drastic change. That concern revolves around the 27 partnerships throughout Maine that make up the state’s community health infrastructure, doing outreach related to tobacco, drugs, obesity and other health problems. The partnerships are providing wellness education and preventive care under contracts with the Maine Department of Health and Human Services that expire in July 2016. Earlier this year, the department told the Legislature’s watchdog office that it expects to release this fall a request for proposals for the next contract cycle. The request for proposal process has been mostly perfunctory in the past, but it may not be now: In a 2015 budget proposal, the Republican governor proposed a funding cut that advocates said would all but eliminate the partnerships. But advocates say recent history may foreshadow big changes. “I think there are reasons to be a little concerned with what these contracts are going to look like,” said Tina Pettengill, director of the Maine Public Health Association. The LePage administration has not only proposed deep cuts to the partnerships, but it has criticized their efficacy. The partnerships receive about $5 million per year in funding from the Fund for a Healthy Maine — about a tenth of the fund, which is made up of money from a 1998 tobacco settlement. But earlier this year, the LePage administration proposed taking $10 million per year from the fund to maintain elevated reimbursement rates for primary care to recipients of Medicaid, the federal-state health care system for low-income people, that were set to expire. This would shift smoking cessation spending to the primary care setting, which the department defended in a fact sheet, saying that while Maine’s per-capita spending on those efforts was among the highest in the nation, its drop in smoking only exceeded the national average by 1 percent. Public health advocates have said that outreach efforts must be prioritized to get ahead of the problem. If the department makes big changes to the partnerships, expect a partisan fight. “We all know the political backdrop to the fund,” said Gordon Smith, executive vice president of the Maine Medical Association, because “there’s a dynamic that set up with the LePage administration and Republicans wanting to make a lot of changes” around public health. If the department makes changes to the partnerships, Smith said it would cause “considerable tension and friction” between the LePage administration and grantees. That tension would “play out largely in a partisan manner,” with Democrats in the Legislature siding with the grantees. Smith said it’s “a bad time” for a fight, “because we really need those Healthy Maine Partnerships to help us with the opiate epidemic.” In the first half of the year, 105 people died of drug overdoses in Maine. Rep. Drew Gattine, D-Westbrook, who co-chairs the Legislature’s Health and Human Services Committee and is the top critic of LePage’s health policy, said he didn’t want to speculate too much about the plans, but given the administration’s history, he’s “very interested to see” them. “Public health’s role and reach needs to be broader than simply what’s provided at the Medicaid level,” he said.